Provide an unedited, clear, straight-on, complete photo of the item being authenticated (natural light preferred). Zipper Pull. 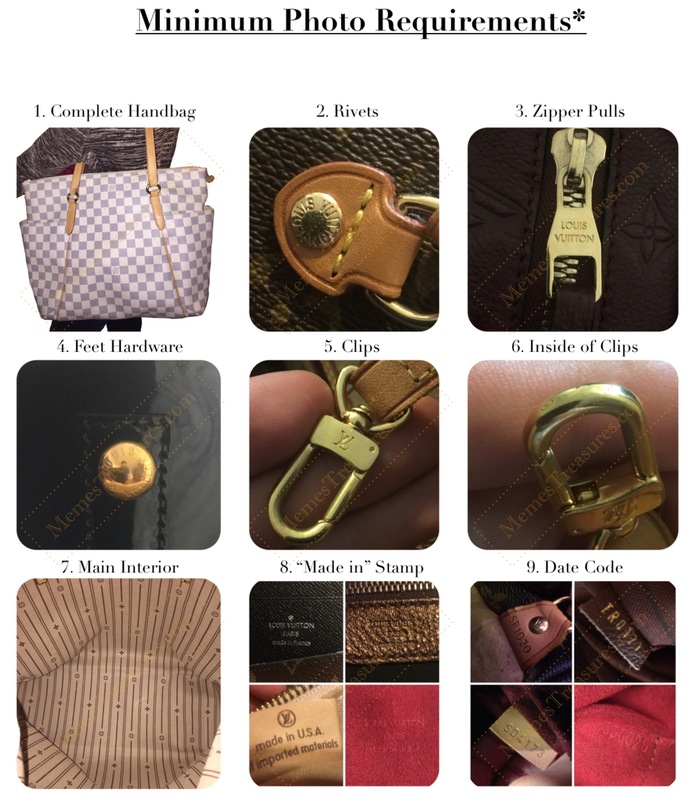 Please provide us with a clear, straight-on, photo of the item’s primary zipper pull. Feet Hardware. For items with protective feet hardware, we require a clear, straight-on shot of the hardware engraving on one of the feet. (See example photo). Clips. For items with clips (i.e. Neverfull Totes), please provide a clear & straight-on shot of the entire clip. Clip Mechanism. In addition to the straight-on photo, please use our guide to obtain a clear shot of the spring mechanism inside your clip. Item Interior. If applicable, please take a clear photo of the entire primary compartment of your item. Use flash for best results. “Made in Stamp”. The “Made in Stamp” can present itself in many styles and on many different material types. If the stamp does not say the COUNTRY of manufacture, it is an item made in the United States and has a cloth tag attached to the interior of the item. Reference photo item #8 and provide a clear photo of this tag. Date Code. The date code, just like the “Made in Stamp”, can sometimes be very difficult to locate and even harder to get a photo of. Reference our photo item #9 and do the best to obtain a clear shot of this code. What brand would you like to authenticate?